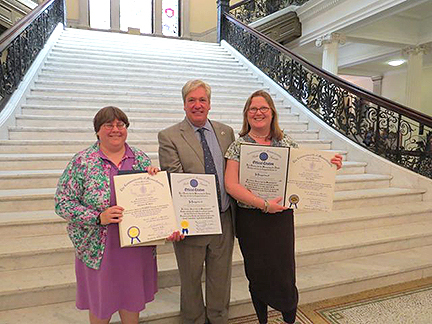 Falmouth High School's Christine Brothers and Jane Baker traveled to the State House in Boston on May 11 to accept awards for "Excellence in Energy and Environmental Education." Falmouth won two of the 25 state school awards this year, given by State Secretary of Energy and Environmental Affairs Matthew Beaton, State Representative Timothy Madden and State Senator Vinny deMacedo. Ms. Brothers, the district's 7-12 Science Department head, was honored for her work incorporating environmental education to the Falmouth STEM programs; art teacher Ms. Baker was recognized for bridging environmental education and arts education through her Antarctica and Seal projects.